For your special day, your wedding guests deserve a wedding favor that will make them remember your wedding for many years to come. But how do you know where to start looking for THE perfect unique wedding favour and how to come up with that perfect wedding favour idea. Well here are some pointers and ideas on choosing the perfect wedding favor. Besides for spoiling your guests, wedding favours can also be an extension to your décor and double up as placecard holders if chosen wisely and can complement your table setting and theme. Photo coaster favours: Coasters with a photo of the bride and groom are great for giving those that care about you most a sentimental gift to display in their home. Box and bag favours: Boxes and bags can do the job at impressing your guests and presenting almost anything in a stylish way. 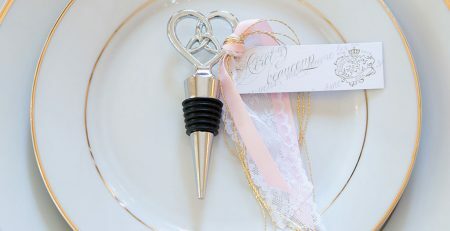 Wine Bottle stopper favours: Wine stopper favors come in various shapes and designs and give your guests a useful gift that they will use for many years to come. Candle and candle holder favors: Everyone loves the romantic glow of a candle and they can double up as beautiful décor to add a romantic ambience to your wedding day. Placecard holder favours: There are many different placecard holder favors available and most favours can be doubled up as a placecard holder by attaching a thank you note with the persons name. Keyring favours: Everyone could do with a new keyring to replace that old one that they have had for many years. Customize a keyring or give your guests a useful keyring like a keyring torch to help them light their way home after your wedding. If you are having a theme for your wedding, the obvious choice would be to select a wedding favour that will compliment your theme. And if you just can’t pinpoint that perfect wedding favour idea, give us a shout and we will give you some suggestions.